Blue Cone Monochromacy (BCM), also known as X-linked Achromatopsia, is a rare genetic disease of the retina that almost exclusively affects males (with an incidence of 1 in 100,000 individuals). It is a hereditary condition, and manifests itself with a partial dysfunction of the cones of the retina linked to the X chromosome. It causes a loss of visual acuity, photophobia, myopia (in many cases) and infantile nystagmus, which sometimes persists into adulthood. Colour vision is severely impaired from birth, with the residual capacity permitted by the blue cones and the rods. The back of the eye appears normal yet in rare cases in older individual macular atrophy can occur. 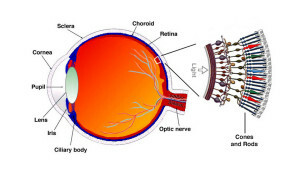 BCM affects cone in the eye’s retina. A child with BCM: low vision force him to write very close to the paper.